"Skycrane" redirects here. For the similarly named Flying Crane, see Hughes XH-17. For the Mars rover landing mechanism, see Mars Science Laboratory § Sky crane landing. The Sikorsky S-64 Skycrane is an American twin-engine heavy-lift helicopter. It is the civil version of the United States Army's CH-54 Tarhe. It is currently produced as the S-64 Aircrane by Erickson Inc.. The Sikorsky S-64 was designed as an enlarged version of the prototype flying crane helicopter, the Sikorsky S-60. The S-64 had a six-blade main rotor and was powered by two 4,050 shaft horsepower (3,020 kW) Pratt & Whitney JFTD12A turboshaft engines. The prototype S-64 first flew on 9 May 1962 and was followed by two further examples for evaluation by the German armed forces. The Germans did not place an order, but the United States Army placed an initial order for six S-64A helicopters (with the designation YCH-54A Tarhe). Seven S-64E variants were built by Sikorsky for the civil market. Originally a Sikorsky Aircraft product, the type certificate and manufacturing rights were purchased from them by Erickson Air-Crane in 1992. Since that time, Erickson Air-Crane has become the manufacturer and world's largest operator of S-64 Aircranes and has made over 1,350 changes to the airframe, instrumentation, and payload capabilities of the helicopter. 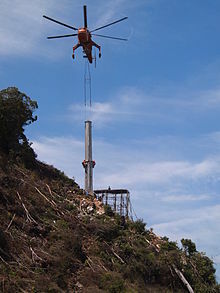 The Aircrane can be fitted with a 2,650-gallon (~10,000 liter) fixed retardant tank to assist in the control of bush fires, and it has proved itself admirably in this role. The helicopter is capable of refilling 10,000 liters of water in 45 seconds from a water slide of only 18 inches or 46 cm thick. Erickson is manufacturing new S-64s, as well as remanufacturing existing CH-54s. Erickson gives each of its S-64s an individual name, the best-known being "Elvis", used in fighting fires in Australia alongside "The Incredible Hulk" and "Isabelle". Other operators, such as Siller Brothers, have followed with their Sikorsky S-64E, Andy's Pride. The Erickson S-64E nicknamed "Olga" was used to lift the top section of the CN Tower into place in Toronto, Ontario, Canada. Twin-engined heavy-lift helicopter, 3 built. 1 rebuilt as S-64E . Upgraded & certified CH-54A helicopters, plus one new build aircraft. 17 aircraft in total. Upgraded & certified CH-54B helicopters. Powered by two Pratt & Whitney JFTD12-5A engines. 13 aircraft in total. N189AC "Gypsy Lady" – crashed in Ojai, California on October 1, 2006. While operating for the USFS The Erickson S-64 snagged a dip tank and the helicopter rolled over and crashed. N248AC "Aurora" – S-64E; named after Aurora State Airport, home to Columbia Helicopters, former owner of aircraft. Crashed on 26 August 2004 in Corsica, killing its Canadian pilot and French co-pilot. The aircrane was chartered by the interior ministry to fight fires on the French Mediterranean island of Corsica. It had been fighting a wildfire as it went down near the village of Ventiseri, trying to return to a nearby military base, due to technical problems associated with inflight breakup. N173AC "Christine" - S64E; ditched into a small dam within Melbourne's water catchment with no casualties during a firefighting operation in Gippsland, Victoria, Australia on 28 January 2019. The crew, consisting of 2 pilots and the flight engineer, were able to bail from the aircraft in 2-3m of water and swim to safety with no life-threatening injuries. ^ "Sikorsky s-64 CH-54 in USA: Erickson". Helis.com. Archived from the original on 30 July 2017. Retrieved 30 July 2017. ^ Jackson, Paul (1976). German Military Aviation 1956–1976. Midland Counties Publications. ISBN 0-904597-03-2. ^ "Firefighting Services - Erickson Incorporated". ericksoninc.com. Archived from the original on 7 November 2017. Retrieved 27 April 2018. ^ "S-64 c/n 64-003". Helis.com. Archived from the original on 30 July 2017. Retrieved 30 July 2017. ^ "S-64E". Helis.com. Archived from the original on 27 May 2017. Retrieved 30 July 2017. ^ "CH-54B Tarhe". Helis.com. Archived from the original on 30 July 2017. Retrieved 30 July 2017. ^ "Corpo Forestale dello Stato Elicottero S 64 F". Archived from the original on 28 October 2012. Retrieved 26 January 2013. ^ "Korea Forest Service S-64". Archived from the original on 10 July 2015. Retrieved 17 March 2013. ^ "KFS Sikorsky S-64E Skycrane". Demand media. Archived from the original on 3 June 2015. Retrieved 26 January 2013. ^ a b "Helispot photo". Helispot.com. Archived from the original on 11 July 2011. Retrieved 2010-12-20. ^ "the origins of Erickson Air-Crane". Erickson Air-Crane, Inc. 2013. Archived from the original on 29 March 2013. Retrieved 26 January 2013. ^ "Evergreen S-64 spec. sheet" (PDF). evergreenaviation.com. Archived from the original (PDF) on 12 May 2012. Retrieved 26 January 2013. ^ "HTS Fleet". htshelicopters.com. Archived from the original on 7 November 2012. Retrieved 26 January 2013. ^ "S-64 Aircranes for L.A.?". ainonline.com. Archived from the original on 21 May 2014. Retrieved 17 March 2013. ^ "LAFD S-64". emergencyrigs.net. Archived from the original on 21 May 2014. Retrieved 26 January 2013. ^ "L.A. County S-64". finance.yahoo.com. Archived from the original on 21 May 2014. Retrieved 17 March 2013. 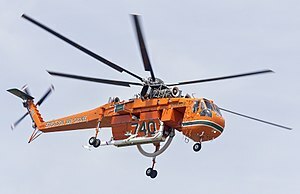 ^ "Erickson Air-Crane buys Sun Bird aircraft from San Diego Gas & Electric". Helihub.com. Archived from the original on 9 October 2012. Retrieved 26 January 2013. ^ "Siller Fleet". sillerhelicopters.com. Archived from the original on 28 September 2013. Retrieved 20 September 2013. ^ "NTSB report (LAX07TA001)". Ntsb.gov. Archived from the original on 14 January 2016. Retrieved 7 September 2015. ^ "NTSB report – NYC07WA152". Ntsb.gov. 26 April 2007. Archived from the original on 19 February 2009. Retrieved 2010-12-20. ^ "NTSB report – WAS04WA012". Ntsb.gov. 26 August 2004. Archived from the original on 31 July 2010. Retrieved 2010-12-20. ^ "NTSB probes Air-Crane crash – September 9, 2004". Archive.mailtribune.com. 9 September 2004. Archived from the original on 7 July 2012. Retrieved 2010-12-20. Wikimedia Commons has media related to Sikorsky S-64 Skycrane. This page was last edited on 7 February 2019, at 02:25 (UTC).